This post could also be called: An accidental study of technology and the classical musician. Recently I had the opportunity to perform an experiment using an orchestra, Ableton Live, and the convolution reverb “Spaces” by EastWest. The experiment – adding an ambient environment to the orchestra rehearsals – yielded mixed results but was a success in many ways. One orchestra rehearses in a gorgeous (visually and aurally) environment. We get to have rehearsals on stage in the room in which we actually perform. The reverb length and timbre is exceptional for listening to acoustically generated music. When sections of the orchestra are rehearsed individually, you can hear the beautiful, full spectrum decay of the sound produced on stage. It is an exciting place to rehearse music given the responsiveness of the environment. The other orchestra rehearses in a middle school band room. The room is designed to be very dead acoustically and is a good place to rehearse. But when compared to rehearsing in the auditorium environment, it is difficult to hear the blend of the instruments, or to feel the effect of your part in the overall sound of the group. Simply stated, the problem was; How could I bring the ambiance of the beautiful environment of the first orchestra to the band room of the second orchestra. Initially at our rehearsal, I set up 2 speakers in the band room in front of the orchestra, one on the left near the cellos and basses and the other on the right in front of the first violins. I placed two cardioid condenser mics (Behringer C-2 matched pair) in front of the group and placed the mics as high up as the mic stands would allow. 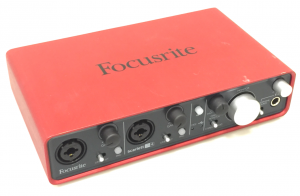 Focusrite 2i4 audio interface. I love the Focusrite 2i4. Compact, 2 in/4 out, phantom power, bus powered and a USB connection. It has been very dependable and is (for me) the best, small footprint 2in/4 out audio interface since it allows me to do DJ style cueing when performing with Ableton Live. The mics were connected to a Focusrite 2i4 audio interface which was connected to a Macbook Pro running Ableton Live 9.2. Track 1 was armed in Ableton Live. Monitor I/O was set was set to In. The EastWest convolution reverb product “Spaces” was added to device view of track one. 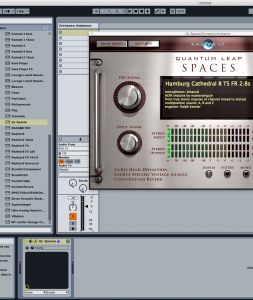 We chose to use the reverb of a church in Hamburg, Germany with a 2.8 second decay time. The dry signal in Spaces was turned completely off while the wet signal was set at 100%. I rolled off a small amount of the low end (below 100hz) with the filter found in Spaces. The second week we used the system, I set up two more speakers in the back of the room – again on the left and right. We also added a 31 band stereo EQ and used it to “ring out” hot frequencies in the room. That allowed me to get a bit more even response in the system and I never had any feedback problems even though the mics were relatively close to the speakers and in front of them. (Which by the way is why we chose cardioid mics instead of omni – the rejection of sound behind the mic was essential given their placement). One important part of this experiment (to my thinking) was to add no volume at all to the performance of the musicians. Adding just the reverb of a great space was the goal. Once the system was active it took a bit of trial and error to find an appropriate volume level. At both rehearsals where we added the reverb, the results were very good. The levels that we had guessed would work with the actual group were pretty close to what actually worked. I tried to go with less volume of the reverb than more since due to the method of how we produced the ambiance, using speakers instead of the true complex reflections of the environment, I felt that the perception of the newly added ambiance could feel artificial and un-natural. The results, sonically at least, were far better than we anticipated. Just as in a real environment, the loud passages of the musicians instruments masked the added room ambiance. The technique really shined on quiet passages or whenever a rest was after a forte passage. We were rehearsing Mozarts “The Magic Flute” and the rests at the beginning really exposed the ambiance that had been added. Our conductor of the orchestra unconsciously started working with the reverb in that he would wait for the full decay of the sound before cueing the next entrance. Overall the rehearsals sound much more musical and I think provided good experience for getting used to our upcoming performance at the local civic center (which has an unruly and long natural reverb). Technologically, there were no problems that were insurmountable. One problem was that when we were not playing and the conductor spoke to the group, the mics picked up his voice. It made him sound like he was in a canyon. The visual disconnect between his speaking in front of the group yet hearing the sound of him in a large room was a bit disconcerting. Although we didn’t get to implement the solution (more on that later) I thought the solution was to mute the reverb while he was talking to the group and then turn it on when we played. I had prepared to use the Ableton remote controller “Touchable” on the Ipad to control the reverb from the bass section where I sat. The biggest problem were just a few of the musicians themselves. Most classical or legit musicians (seem to) see speakers and are sure that they have only one setting: LOUD. And many times they are right. I have experienced (and been guilty of) using too much volume on my electric bass when I have played pops pieces with the orchestra. I have become keenly aware of the volume limitations (and great expressive potential!) of traditional acoustic instruments. That attitude (to loud!) led to a few of the musicians complaining of how loud the speakers were, even though they were set at a much lower volume than the performing group. The ambient project has been halted. But the information I learned by doing it has been invaluable. 1) Adding artificial ambiance to the rehearsals of an acoustic group provides tangible improvement to the sound and potentially to the performance of the group. 2) The technology used to achieve this is simple, dependable, and not particularly expensive. Other DAW software than Ableton Live and different hardware could easily be used to achieve similar results. 3) The biggest problems were in the perceptions of some of the musicians. In hindsight I think presenting the idea to the orchestra and getting their buy-in as to the experimental nature of the project may have provided a tool to deal with the perceived problems that ended the project. It always fascinates me how technology implementation is so dependent on the attitudes of the people that use it. In the future, should I have an acoustic group that rehearsed in a less than ideal space, I would not hesitate to use this technique to enhance the rehearsals. Music just sounds better in a beautiful space. Next up – creating an IR file of the performance hall with the first orchestra mentioned in this piece. I’ll write up what we did and post the IRs. I just thought and wondered if you considered keeping your omnidirectional signal omnidirectional, instead of turning it more directional. People never seem to get, (and I know you do) that one of the real differences between any real acoustic verb, and the electronic fashion, is that real verb collapses rather omnidirectionally. So when the last note ends, you tend to sense the entire room collapse, regardless of the directional program material. It’s what makes it dramatic and satisfying in it’s human perception of size. Our ears are horizontal and therefore recognize this aural information. In live settings, a reverb processor unfortunately comes out the same speakers as a performer and fails to produce this room collapse, and is more just like the ‘sound’ of a room collapse. But it doesn’t actually decay across the whole room. That’s why processed reverb will never sound like true acoustic reverb. Your brain can tell the difference. In this sense, I would have tried to point your effects speakers anywhere perhaps to the ceiling or far wall (don’t know your room) in attempts to recreate a true acoustic reverb via an entire room acoustic reverb collapse. Almost like Dolby Atmos. Fire the material off the ceiling if applicable. Good luck dealing with the perceptions of the musicians! But this method would likely also lower their awareness acoustically. Plus they would all receive a more similar volume than the directional method. We sometimes delay loudspeakers just a bit more than technically necessary for the same reason. It makes people not notice them as easy.